All about the new NuForce 100 series components at Totally Wired. Building on the phenomenal success of the affordable and compact Icon range, we're thrilled to bring you a brand new range of ultra high performance components from the smartest company we've ever dealt with. NuForce redefine what a modern hifi system will look and sound like - all digital, sleek and a joy to own. Star of the show right now is the new DDA-100 integrated amplifier. Already the subject of fantastic reviews and awards, the DDA 100 is really just the start of the range. Like the Icon range, this new series from NuForce includes both Integrated and separate designs - but with a series of innovative and unique configurations that will fit right in to the modern digital lifestyle. You'll also learn that some of these components will also be equally fantastic in analogue systems. So - The DDA-100is the entry to the range - an integrated all digital amplifier that sets a new standard for any amplifier under $2500 and a great many beyond. While the DDA 100 is our starting point, it is by no means where this story ends. If we quickly look at the existing Icon range, the DIA (which has proved to be the most popular amplifier model we have ever sold from any brand) is similar in features to the DDA 100 - 3 digital inputs, one pair of speaker outputs. And while unassailable value for money, the Icon Dia is outperformed by a combination of the Icon HDP digital preamp and one or even two Icon stereo power amps. In fact if you want great sound and value from NuForce combined with both digital and analogue inputs, this is still the way to go for around the same price as the DDA 100. But if going digital only, it's all one way traffic. With Nuforce, the separate components offer even higher performance and a unique array of choices… 3 front end components and one power amplifier. You'll note I haven’t called these components pre-amps or DACs - NuForce are doing things differently and it does take a little bit of understanding to see exactly how to get the most out of these systems. The DAC-80 is the newest and possibly easiest component to start with - call it a DAC with volume control or a multiple digital input preamplifier. It's a measure of how fast NuForce move that this has replaced the DAC-100 that may only have had a 12 month lifespan, but there are good reasons for this. The DAC-80 is designed to better fit in with the other 100 series products. It both simplifies and improves upon the DAC-100s already high levels of performance - and does so at a lower cost. It is, in our estimation, the finest multiple input DAC you can own under $2000 by a wide margin and will dramatically improve the sound of almost any digital system - via USB, coax or optical digital inputs. The volume control allows direct connection to both integrated amplifiers and power amplifiers. While the NuForce HDP has been our best selling DAC for the last three years, the new DAC-80 is set to really show everyone how it is done. So for any existing system, the insertion of the DAC-80 is going to be a phenomenal upgrade. Connect any disc player, computer, or wireless device such as Apple Airport to it and you're going to be in for a treat. There will be systems where a computer is in proximity - or a components such as the Mac Mini which has a USB output - if this is the case, the UDH-100 may in fact be the better option. It could be described as a very high quality headphone amplifier the a USB DAC input which would put it into the 'desk top audio' niche - and certainly it is right at the top of this particular genre. But also as an asynchronous USB DAC for use in any system, it is a stellar performer. So in short, if your computer is your only source, this is the DAC for you. The HAP-100 initially stuck us as an enigma within the range - it's a simple and compact Class A 4 input analogue preamplifier with headphone output. But once connected its place becomes obvious. The key to the HAP-100 is its output - this is an active preamplifier and boosts output to 7.8vrms - the DAC-80 and UDH are the standard 2v line outputs (although variable and specified at 1.97v if we are to be completely accurate). Most people underestimate the importance of preamplifier performance in a system - but for many years (and with many different brands) we have found that the perceived impact a preamplifier can make is often greater than that made by upgrading power amplifiers. Not only will you gain in terms of quality, but the better dynamics conferred by a quality preamplifier can often make and existing power amplifier sound much ‘bigger’ for want of a better word. A good preamplifier drives and controls a power amplifier. The volume control on the HAP-100 is something special - it actually shares a lot with the NZ made Pure Audio preamplifier - rather than being a conventional 'pot' the HAP-100 exploits NuForce's most recent work in volume controls. At the unit's core is a switched-resistor ladder network of low-noise, thin-film resistors, one per volume setting, permitting discrete, high-resolution increments of 1dB for the HAP-100's one hundred volume steps. The HAP-100 is a real eye opener - the abundance of detail it extracts, the incredibly low noise floor and sheer wealth of music it produces are unequalled at anything even starting to approach its most affordable price - anyone with an NZ built pre and power combination should be taking notice right now. If there is one word to apply to this preamplifier it is 'transparent' - it just lets much more music through. The HAP-100 could well be the biggest upgrade you could possibly make and while it is neither large or feature festooned, it’s all about music. We know of plenty of preamplifiers from $1000 to $4000 that will literally be blown out of the water by this baby. Even if we just used it as a headphone amplifier (and again, there are plenty of supposedly similar products at this price level), the HAP-100 is special in more ways than we can innumerate. If we could be critical of one aspect of either the DAC-80 or UDH-100, it is that while they will match well with integrated amps and sensitive power amplifiers, they will not push many larger power amps to their maximum - and this is where the HAP-100 comes in with its ability to take every ounce of detail and boost it. What these combinations give us is something directly cost and feature comparable with our other top dogs in the digital world – the Meridian Director and the Wadia 121. While the Wadia provides balanced outputs and AES-EBU, the Nuforce combinations also allow the integration of analogue components via the 4 inputs on the HAP-100. This is literally giving you the best of all worlds. While all three NuForce components - the DAC-80, UDH-100 and HAP-100 can slot into existing systems, you can also choose to follow the logical path being laid out and now look at the new STA-100 power amplifier. The STA-100 is not like any other power amplifier you will be familiar with. It is not big, it doesn’t produce much at all in the way of heat - in fact it barely gets warm. It most certainly doesn’t hum or hiss. But having had one at home for over two weeks at the time of writing this, I am absolutely taken with it. It is the perfect example of what NuForce can do - this is a radical design that will confound the pundits but thrill the music lover - a small (tiny even) cool running power amplifier with an astonishing rating and low price that sounds so much better than we’d ever hoped. 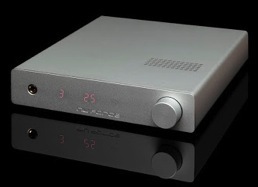 NuForce developed the STA-100 amplifier for the audio enthusiast as an audiophile-grade stereo power amp. Offering quality parts throughout and advanced, high-efficiency switching amplifier operation, the STA-100 delivers a remarkable amount of power -effectively twice that of the highly regarded DDA-100 integrated model. Sharing technology with NuForce's award-winning V3 amplifiers, mere power alone doesn't tell the whole story. Despite being resolutely solid state it actually has a warm, tube-like midrange - balanced by exceptional detail and sound-staging. And bass that is completely out of proportion with the physical size of the amplifier - cliche it may be but the STA100 sounds much bigger than it looks. Proprietary feedback circuitry operates as the cornerstone of the STA-100’s sound quality. A self-resonant design, the 400 kHz PWM switching frequency constantly adjusts to the input signal, output current demands, and loudspeaker impedance variations. I have heard better amplifiers, but they are all much, much more costly and given all the things the STA-100 does so right, I'm more than happy to have this amplifier at home and save several thousand. If my speakers were bi-wire-able I might even have two! Like the rest of the 100 series components, the STA100 is remarkably quiet when it counts - and in the case of a power amplifier this is all the more important - especially when combined with the high input sensitivity this design has - what this means is that you can match it with both the DAC-80 and UDH-100 and their 1.97v output will easily drive it. And both of these combinations offer a worthwhile upgrade over the DDA-100 with both higher resolution and much more power. But it's actually the addition of the HAP-100 that really makes the STA-100 open up - the preamplifier has real driving power and so in combination, you get a much more dynamic and solid sound - the power rating may be unchanged but it really sounds bigger. Small and affordable as it is, if you want to get the measure of the STA-100 don't restrict your speaker choice. While it will certainly make the most of any of our easily affordable and compact models from Monitor Audio, you can run any floor standers and as we've proved to ourselves at home it sounds spectacular with Sonus fabers. So you have a 3 stage progression in performance from NuForce - the DDA-100 as entry level, the UDH-100 or DAC-80 and STA-100 combination, or the full 3 box system for the best possible sound quality and greatest flexibility with both digital and analogue inputs plus state of the art headphone listening. Which is of course another aspect to the story - as headphone amplifiers, the UDH-100 and HAP-100 are as good as it gets - one digital, one analogue with zero compromise on each. At only $250 more than the highly regarded NuForce HDP, these two preamps are not only significant improvements but actually offer even better value. Although we are placing most emphasis on the digital capabilities of the NuForce combinations, the analogue combination of the HAP and STA-100 is not to be underestimated - at just on $2000 together they exist in a territory dominated by integrated models - often with more features in terms of inputs and outputs. Yet taken purely on their sound quality and power, they are seriously competitive with the very best designs - and as I've touched on before, the ability to bi-amplify in many systems for a makes for and affordable and effective upgrade path. With all of theses possibilities and permutations it is taking a little while to uncover all the finer points of these components from NuForce. Each piece is a remarkable combination of clear thinking, higher than expected performance and remarkable value. Individually or in combination we're talking about game breaking stuff. NuForce DDA-100 digital amplifer NZ$ 695, was $899. Buy any new pair of speakers in our range and the NuForce DDA-100 is just $695. Match the DDA-100 with any of our wide range of speakers - Monitor Audio, Sonus faber or Cambridge Audio and build your own great sounding digital system for far less than you'd expect. A simple system with the DDA-100 and a pair of speakers will outperform any conventional option at the same price - and a great many for more. Whether you are playing music from your computer, iPhone, CD or BluRay player, AirPort Express or Apple TV, the DDA100 is the smart, powerful cool running alternative to conventional amplifiers. It's so easy to enjoy music with the NuForce I cannot see why anyone looking at their first system, upgrading or just wanting to simplify would not think otherwise. "the sound of the NuForce DDA-100 is so impeccable, up to the point when it runs out of power, is still a sonic bargain. I haven’t heard any integrated amplifier with DAC capabilities priced near this combo that offers any serious sonic competition. You may find that the DDA-100 is simply the best integrated amplifier solution that you've ever heard. And for those readers who still firmly believe that all-digital amplifiers are for someone else’s system, listening to the DDA-100 will be, as it was for me, a revelation." We've got a change in NuForce distribution in NZ and so have some sizzling but very limited specials on some of our favorite products. We've selected the best of these from the range for you - all are new and warrantied. The NuForce DDA-100 above is now absolutely unbeatable at this price. And the other separates in the Home 100 range - DACs, the brilliant STA100 power amplifier and matching preamp all represent equally stunning value. These specials will sell out quickly so don't hesitate!